Deane's Dock and Balfour Town as seen from Little Bluff Lookout, Salt Cay. The concrete breakwater at Deane's Dock, Salt Cay. Caution: Be extremely careful when walking on the concrete breakwater as certain sections may become slippery due to standing water and algae. Found at Balfour Town on Salt Cay, this small harbour is the only port and marina on the island. Typically, this harbour is very quiet. However, when the ferry arrives from Grand Turk, it becomes a bit livelier. This harbour is located on the typically sheltered western (leeward) side of Salt Cay. A concrete pier and breakwater wraps around much of Deane’s Dock and provides protection from the ocean swells. Along with the Salt Cay Community Ferry, Deane’s Dock is also the headquarters of Salt Cay Divers and several local fishing boats. It is the centre of activity on the tiny island. Coral Reef Bar and Grill fronts the small beach inside the marina. Although not quite as vibrant as some of the actual reefs in the region, the snorkelling off the pier is sheltered and interesting. If you’re interested in cruising the Turks and Caicos Islands and waters around Salt Cay, check out Getting to the Turks and Caicos by Yacht. The ocean off the west coast of Salt Cay near Deane’s Dock is the best location near the island to anchor due to its typically sheltered conditions from the constant eastern trade winds. Another popular site is the leeward of Big Sand Cay, an uninhabited yet breathtakingly beautiful little cay. Fuel can be expansive and limited on Salt Cay, so if you’re cruising in the archipelago, consider refuelling on Providenciales, Grand Turk, or South Caicos. 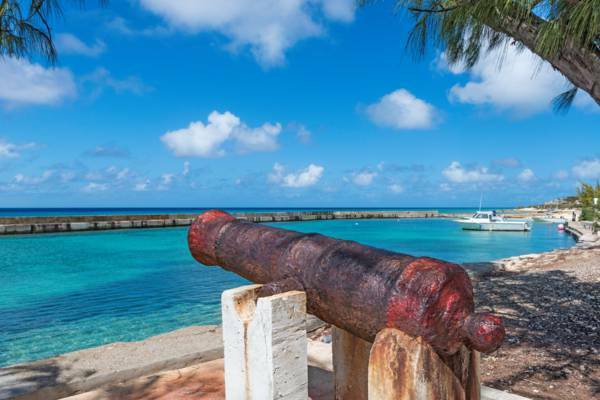 Providenciales offers the greatest selection of marinas and services, including maintenance, repairs, and catering. There are also several marine and fishing shops as well. There is no port-of-entry on Salt Cay. After entering the Turks and Caicos, it’s a requirement to promptly visit at a port-of-entry to clear customs and immigration. Travel into Deane’s Dock is straight forward, yet there isn’t great room for error. We advise that all but the smallest vessels moor outside the harbour confines. A cannon from the HMS Endymion wreck stands guard over Deane's Dock. 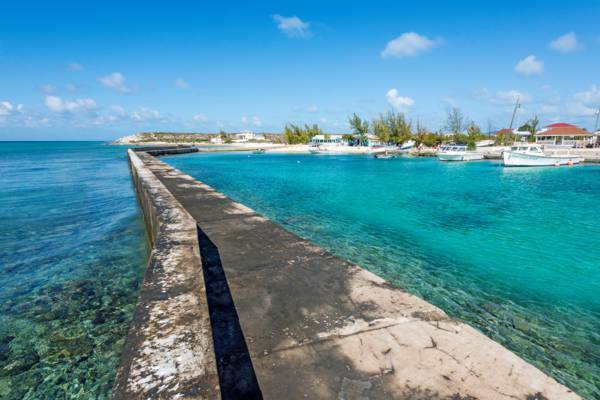 Deane’s Dock is one of the oldest points of development in the Turks and Caicos, with the location having played an important role in sea salt production for hundreds of years. In 1896, the current design and construction of the site (including the breakwater pier) was completed. Over the years, Deane’s Dock naturally decayed and received serious damage from Hurricane Ike in 2008. Long overdue, the site saw refurbishment in 2010. The site is named after Victorian-era salt producer James Deane, or possibly a descendent of his, as several namesake public servants, namely a police constable and a teacher, were also on Salt Cay around the period of the harbour’s construction. A small cannon salvaged from the HMS Endymion wreck can be seen on the southwestern side of the harbour. Deane’s Dock is located on the north-western side of Balfour Town, at the junction of the beachfront Victoria Street and Airport Road, the two largest roads on the island. Last reviewed by an editor on 7 May 2017.